Rustomjee Paramount, Khar(W) enjoys the distinction of being the gated community of choice for Mumbai’s elite. From industrialists to socialites, from professionals to Bollywood celebrities, connoisseurs of fine lifestyle have chosen to call Rustomjee Paramount home. Joining the elite gentry of residents at Rustomjee Paramount will be Tiger Shroff .Tiger has apparently been on the search for an apartment and was very pleased to find one that has the perfect location, amazing amenities and excellent gentry here at Rustomjee Paramount. The multi-storeyed towers are designed by renowned architects Sanjay Puri from Sanjay Puri Architects, Mumbai. The self-sufficient gated community is strategically located – with easy access to the Western Express Highway, S.V. Road, Bandra-Worli Sealink and also the international airport. It is close to the BKC business district as well as in proximity to education, healthcare and entertainment facilities. Most of the residences have sea views and the project is in great demand by discerning clients, such that the A and B Wing have been sold out. Living in a gated community fosters a sense of bonhomie and the chance to connect with like-minded individuals who share similar status and interests in life. Your kids get the chance to make friendships that will last a lifetime. This is probably the only project in the Bandra-Khar area which has over 30 amenities that further provide opportunities to bond with your neighbors either while taking a dip in the saltwater pool or watching your kids have a play date in the Toddler’s Studio. Elderly residents can enjoy the peace and quiet of the Senior Citizen’s Zone… all while being assured that their safety and security has been taken care of. In fact, the Alfresco sky lounge, Toddler Studio, Banquet Hall, Gymnasium, Indoor Games Room and Business Centre are ready and functional, with several events already being hosted at the Alfresco Sky Lounge for the benefit of the residents and their guests. Rustomjee ensures that residents can truly enjoy the luxury of space – ‘My Space’ – the opportunity to unwind and de-stress with their hobbies and interests. “Mom, why isn’t the colour of my skin blue, like Lord Shiva?” asked ten year old Ankit. After the narration of the legend of how Shiva swallowed poison which he held in his throat thus making his skin blue, a google search by Ankit’s mother also lead to biological reasons of the colour of human skin. Touching his skin, Ankit learned about melanin and racial discrimination. Knowledge can barely be taught or transferred, it has to be experienced and assimilated, in the background of personal context. ‘Why do I sleep at night instead of the morning?’ Or ‘why is it that I need a dark room to sleep?’ While a biology class may have taught you and your children the correlation between light and the release of sleep hormone melatonin in the brain, more often than not, you tend to forget a lot of the details. This is simply because not enough time is spent in assimilating the information we receive. There are ways that you can help your child know more than you did, understand better that you did. While schools systems are increasingly moving towards practical styles of teaching, there are alternative ways of educating your child. Familiarity ebbs away the ‘wonder’ in our minds. You are reading this post on a screen. Do you know what and how it’s made? What if I were to tell you that your iphone screen has sapphire in it? Now go and see the world through your child’s eyes and identify where familiarity is setting in. Ask a question and shake him/her out of it. Why are the carrots in your lunchbox yellow? How are clouds formed? Why are they white and of different forms? Knowledge is abundant and easily accessible today. Assimilation of knowledge and its subsequent application is what gives us the edge in today’s world. While ready-made toys are good, there are many others that allow your child to create and discover things in his/her environment. Buy less, buy wise. Purchasing a basic telescope is more beneficial than numerous dolls. Go out with it, find things to put under the lens and let your child revel in the intricacies of nature. Attention span and the ability to focus in the moment – power of the sages, is learnt best from trying to craft the right earthen flower vase on the potter’s wheel or an hour of intense physical activity. Activities wherein you create by your own hand require intense focus. Not only does it help in improving the attention span of a child but also helps them gain insights on the art at hand. While you provide your children with the best of formal education, it is also important to fill the gaps therein. As we at Rustomjee help you do that, we also help the underprivileged move from abundant outdoor education to formal schooling. Every time you buy a home in our project, we sponsor the education of an underprivileged child. Rustomjee Cambridge International launched its new school in Virar (West) today setting another benchmark as the first international school in the city. The purpose behind this is to ensure that students seeking quality education will no longer need to relocate or look for other options outside the city. They now have a reputed school offering international curriculum right at their doorstep. The school is located in the mega township, Global City which is jointly developed by Rustomjee and Evershine Group. Lokneta Shri Hitentra Thakur and Shri Narayan Raoji Mankar, Mayor of Vasai-Virar City Municipal Corporation along with Mr. Boman Irani, CMD, Rustomjee inaugurated the school. At the Real Asset Conference held in association with moneycontrol.com, on 19th March, Mr. Chinmay Gersappa, GM, Corporate & Residential Sales, Rustomjee spoke on the Real estate asset class, that was followed by a panel discussion with eminent personalities from the Real Estate industry. About Rustomjee, Mr. Gersappa comments that it is a predominantly Mumbai based developer, the company’s expertise is residential development, although Rustomjee has also undertaken resi-commercial, retail, across all the regions, but have a strong focus on residential spaces. The panel discussion was moderated by Mr. Santosh Nair – Editor, Moneycontrol.com and joined by experts like – Mr. VK Sharma – CEO, LIC Housing Finance, Mr. Neeraj Bansal – Director (Risk Consulting), KPMG, Mr. Balaji Raghavan – CEO, IndiaInfoline, Mr. Sanjeev Dasgupta – President, ICICI Ventures (Real Estate) and Mr. Abhishek Kapoor – CEO, Rustomjee Urbania. The discussion covered varied topics on the Real estate industry, trends and the issues and opportunities in the real estate sector. The Real Asset panel discussion focused on serious issues like affordability, assured return schemes being offered by developers and key regulatory changes required that need to be tackled for smooth functioning of the real estate industry. 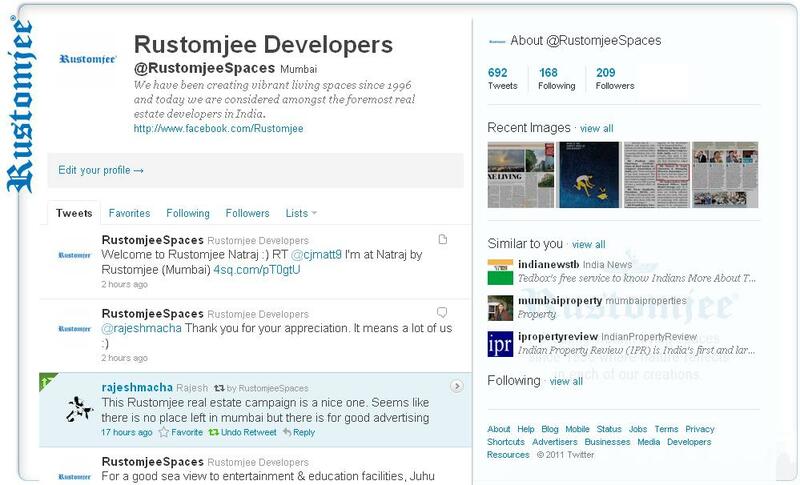 Rustomjee had hosted a live tweetchat with CJ Mathews, Head Marketing at Rustomjee on 27th February, 2013. The chat was focused around the topic “Does online real estate property listing really work?” Read on for comments and insights by CJ Mathews on the credibility of online real estate property listings, key aspects that need to be showcased in an online property listing by any marketeer and the typical sales cycle for these websites. Q1. To start with, would you like to name a few online listing websites as a real estate marketer you visit? Q2. How would you rate the credibility of online real estate property listing websites to make an actual sale? A. It’s pretty important for real estate that we be where the customer is searching for us. WWW is the add-on medium to be present in & is largely becoming the consumer’s first stop for information. Specifically real estate websites are contributors to the process of lead generation & thus critical. Q3. What in your opinion are the 3 key things to showcase when listing a property online? Q4. How credible are the online property listings, from a buyer’s point of view? What is the typical sales cycle for these websites? A. There is that little gap in accuracy of info & I believe consumers are aware of this. Thus real estate websites are credible. Sales cycle starts with WWW being the first stop for information. The next step is verifying data – Meetings with real estate agents & visits to projects follow. Q5. Any personal experience as a marketer on online property listings or tip you want to share? Connect with us on Twitter to be a part of many more such interactive conversations. A view should never be blocked by another building. A window should look out on at least 7,500 trees. A corporate park should be close enough for you to take the 9:23 walk to work. Your child should be able to run home when the school bell rings, go three floors down to the nearest library. Or to the study room next door. It shouldn’t take you an hour to go see a two-hour movie. Play areas should be padded for speedy little devils. Tiles should be anti-skid and stairs should e grandpa-friendly. A mall should be 27 paces. A restaurant 35 paces. A garden should not make way for a parking lot. And a building should have a Pre-Certified Gold Rating from IGBC Green Homes. 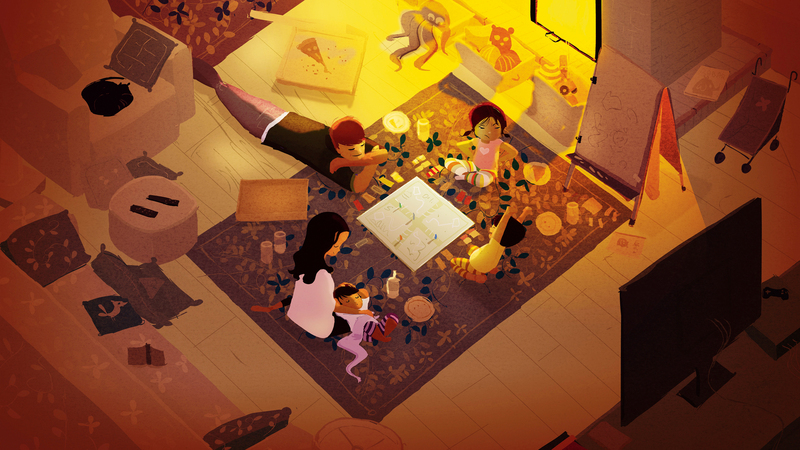 Because we believe, acquiring an apartment in Rustomjee Urbania shouldn’t be about buying a home, it should be about discovering a life. Rustomjee would like to invite you to the ‘India URealty Show’ – London 2012, that is being jointly held by Unesta and Cushman & Wakefield on the 6th & 7th October, 2012, at Wembley, London. ‘India URealty Show 2012’ aims to create an effective platform for interaction and collaboration for potential purchasers or investors in London and realty developers of India. The two-day exhibition will provide a platform to NRIs and PIOs in London to explore investment opportunities in the growing Indian real estate market. We are pleased to announce our participation at the India URealty Show 2012. Our event representatives Mr. Abhishek Kapoor & Mr. Kalpesh Patel shall introduce you to a host of modern living spaces that have been developed by Rustomjee. They shall take you through our promising residential destinations in Mumbai. Here is sharing a brief on what you can expect to see at the event! IGBC Gold Pre Certified, Rustomjee Urbania, is a 127 acre, self-sufficient township with modern living spaces, a School, Sports Clubs & more. Rustomjee Urbania is located in the heart of Thane, and comes equipped with its own commercial complex, a school, retail and entertainment centers, landscaped gardens, jogging tracks, tennis court, sports clubs and a lot more. Rustomjee Urbania also presents a learning center that is the amalgamation of spaces that have been designed as a haven for a secured childhood. The entire activity area has been divided into various space centers catering to different aspects of growth and development. The various space centers are divided across maths, science, words, colours and music. Leon’s World offers a refreshing alternative to the television, computers and video games. True to its name Elita which means “The Chosen One” in Latin, is a 14 storied residential tower with 4 levels of parking amid pristine landscaped terrain, offering premium residences for the selected few. The elegant main entrance lobby dotted with attractive greenery commands views of the landscaped gardens, is poised to be the envy of Juhu. Le Rêve is a boutique residential development adorning the skyline of one of Mumbai’s most upscale locales – Khar West. Situated at one end of serene Pali Hill, the standalone building is a stone’s throw away from some of Mumbai’s choicest gourmet hotspots. Look forward to meeting you at the event! A rapidly developing economy coupled with a fast growing population puts extra pressure on a nation’s infrastructure. 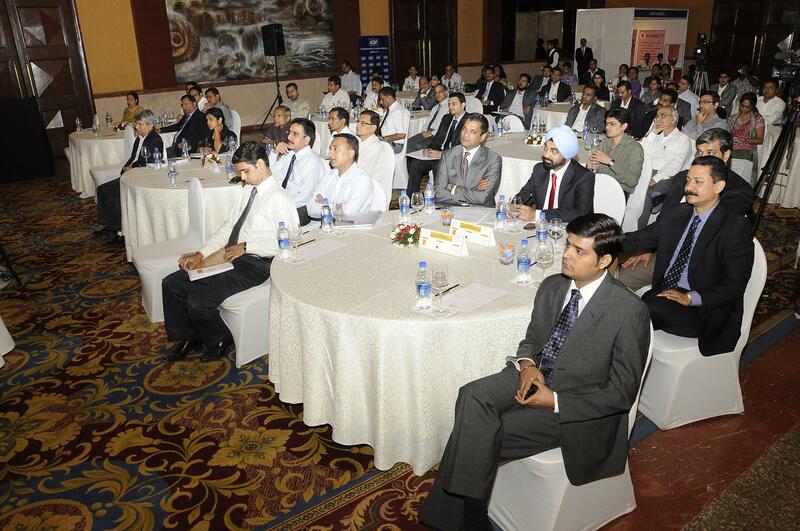 India thus cannot afford to overlook those methods which improve infrastructure, especially project management. 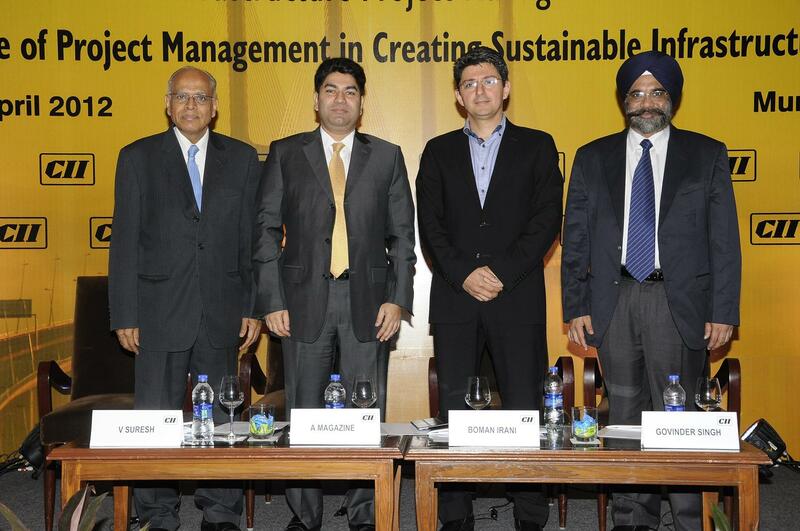 This was the central topic of discussion at the Conference on the Role of Project Management in Creating Sustainable Infrastructure convened by the Confederation of Indian Industry on 18th April, 2012. Mr. Boman Rustom Irani, Chairman & Managing Director, Rustomjee, present his thoughts at the Conference as the Guest of Honour. Mr. Boman Rustom Irani mentioned that the government needs to be an important role player in development of urban centers. There’s a lot of pressure on the nation’s infrastructure. There is a need for constant industry and government engagement to foster infrastructure development. He stressed upon the need for proactive government support for the industry. Project Management is understood as the key to ensure efficiency, quality and timeliness of infrastructure projects. We also discuss development in the field of Real Estate and keep you informed about all real estate news that is of importance to you as a consumer.